There have been angry exchanges at the Scottish parliamentary inquiry into the issues raised by the Shirley McKie fingerprint case. In the face of questioning before the Justice 1 Committee, Ms McKie and her father Iain accused MSPs of attempting to retry her for perjury. 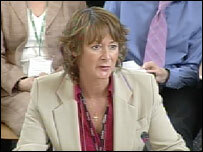 Ms McKie was cleared of leaving a print at a murder scene in 1997. She said she believed the people responsible for her misidentification were still working and still lying. The former detective, who appeared before the committee accompanied by legal adviser Andrew Smith QC, is understood to have sought reassurances about the nature of the questioning she was to face from MSPs. Her father, Mr McKie, had said he was confident the inquiry could help to clear up some of the outstanding questions raised by the case. But he raised objections to the line of questioning from MSPs taking part in proceedings and at one stage Ms McKie said she would refuse to answer questions she was not happy with. Des McNulty MSP asked Mr Smith about a report by independent fingerprint expert Peter Swann that had identified the mark as belonging to Ms McKie. Ms McKie said: "Are you actually putting me on trial again, are you actually questioning my integrity, is that what you're doing? "I'm here to assist this inquiry and I just do not see the relevance of these questions and I'm totally insulted by them." She told him: "The reason Mr Swann wasn't used for the defence was he was wrong and incompetent. "I answered every single question at my trial honestly, unlike some people." Mr McNulty read out part of the transcript from her perjury trial in May 1999, when she had said she did not know who had examined the fingerprint mark. He then referred to a letter dating from March from Ms McKie to her lawyers, asking about the brief prepared for Mr Swann. The Labour MSP said: "Does that not seem to be a slightly strange juxtaposition." Mr McKie said: "You have just read out a totally biased version of what happened in court. "My daughter didn't lie at that trial." Mr Smith explained to the committee a "professional decision" was taken by Ms McKie's legal team, then led by Donald Findlay QC, not to use Mr Swann's report. A suggestion that the dispute could have been caused by a simple difference of opinion between experts was rejected by Mr McKie. Nationalist MSP Bruce McFee said: "Some people suggest this is down to a difference of opinion." But Mr McKie insisted: "It's not a matter of opinion, it's a matter of fact that the SCRO have got it wrong." 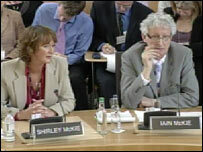 Ms McKie later clashed with Labour's Kenneth Macintosh. The Eastwood MSP represents some of the SCRO fingerprint experts at the centre of the row and told the committee they had suffered as a result of the affair as well. He was asked by Mr McKie: "Are you accusing my daughter of perjury?" He denied this, but Ms McKie said: "You are, you are and it's disgusting." She added: "I'm refusing to answer any more of these questions, if it's the same lies you are going to open up." The 30 witnesses who will appear before the committee include Lord Advocate Colin Boyd QC, Justice Minister Cathy Jamieson and her predecessor Jim Wallace. Ms McKie was accused of leaving her print at the home of Kilmarnock murder victim Marion Ross. She was later cleared and recently received £750,000 in an out-of-court settlement. Ministers have described the events as "an honest mistake". Scottish Criminal Records Office staff have strenuously denied any allegations of wrong-doing.